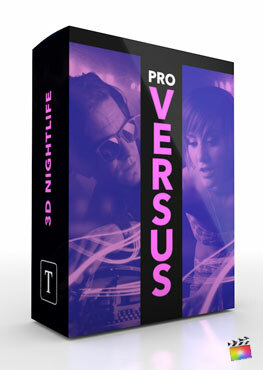 ProVersus 3D Nightlife is a set of 9 customizable presets made exclusively for Final Cut Pro X. Utilize ProVersus as a comparison tool to contrast people, musicians, clubs, and showcase performances. Each 10 second preset features a complete range of text, color, and animation controls that can be found in Final Cut Pros inspector menu. Utilize drop zones for pictures and videos. Instantly add a 3D comparison title to any Final Cut Pro X production with ProVersus 3D Nightlife.